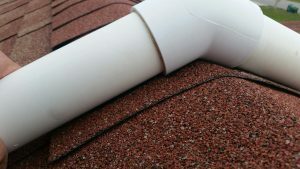 We are asked frequently about the potential for roof leaks by prospective solar pool heating buyers, and understandably so. The roof over your head, and the house under it, are precious. The headache of a leak can by frustrating and expensive. So how do we address this major concern? 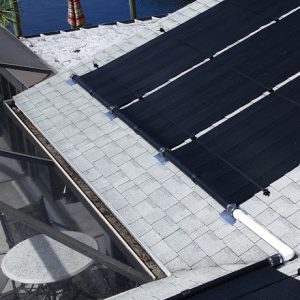 Properly installed solar panels will provide leak-free and worry-free performance. First, it is important to note that the solar pool heating industry as a whole does not have a major roof leak issue. If it did, the industry would not be booming. 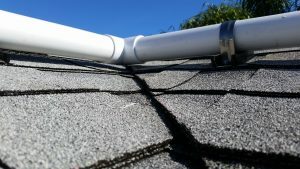 Professional solar contractors are very good at making sure proper techniques are used, and materials and sealants have come a long way. 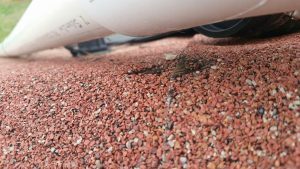 If you read about roof leaks from solar pool heaters, it’s probably an older system, or it was just done wrong. 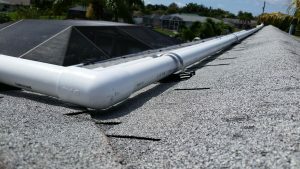 In the local Southwest Florida market, frankly, the whole industry (including our competition) is pretty good about ensuring roofs are protected, but problems do occur occasionally. Although there is a very low chance you will experience and issue, we do a lot more to ensure you have a trouble-free experience than others. Panel couplings rubbing into shingles. 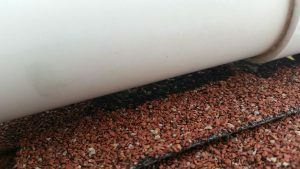 PVC Plumbing rubbing into shingles. PVC pipe clamps improperly installed or sealed. That right — all of those “holes” in your roof from stainless steel fasteners are extremely reliable if done right. The most common and serious issues come from the plumbing and couplings between panels, and their interaction with the roof surface! I don’t want to scare you — for the faint of heart, please look away. 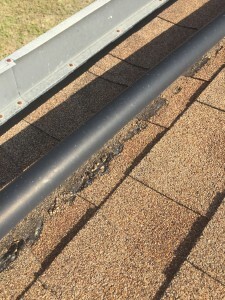 In these pictures below, plumbing installed by other contractors has caused serious roof leaks. These pictures demonstrate what not to do, but some keep doing things the “old fashioned way” for some reason, even though better materials and methods are available. 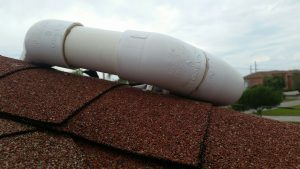 The best way to address plumbing causing abrasion on the roof is to raise the plumbing off of the roof and take special care around fittings and couplings. That sounds obvious, right?! We take every precaution and use special spacers to raise plumbing and secure it at proper intervals. Below are some pictures showing how our materials and methods are far superior, and will work to protect your roof. Where PVC fitting touch shingles, they eventually rub into the roof. Hips and valleys are critical to protect, and fittings can rub into into shingles over time. 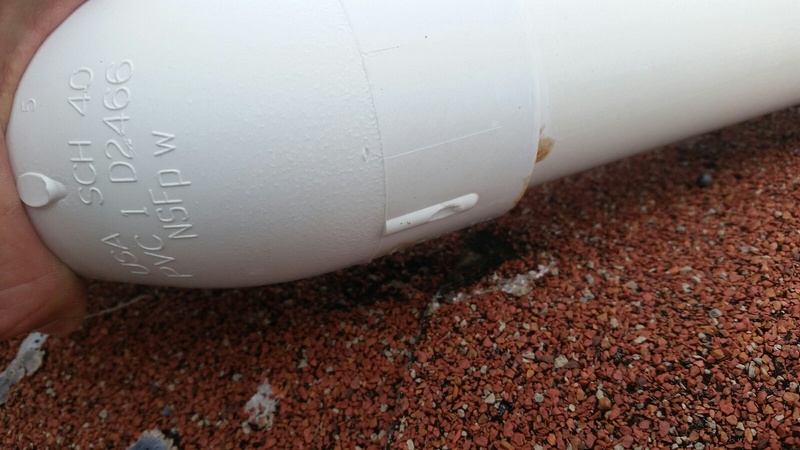 This is sure to cause leaks as pipes move over time, rubbing into the shingle. This is a no-no. The pipe will eventually rub right through the ridge cap without protection. Sure enough, plumbing over a ridge will rib right through the ridge cap if not done right. 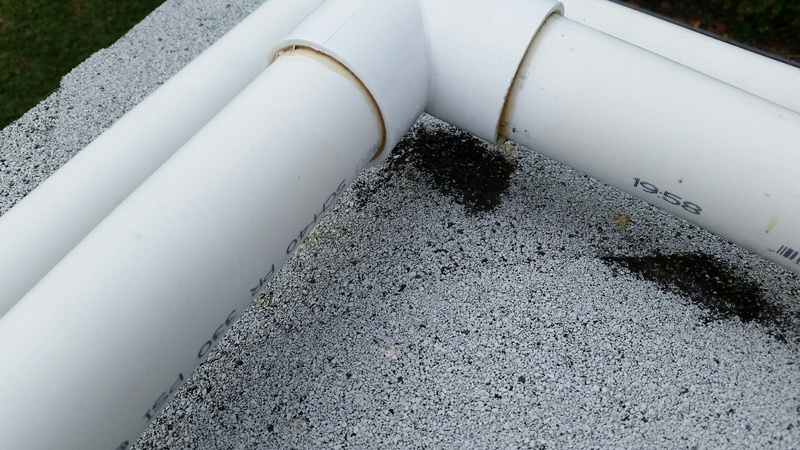 PVC pipes can destroy a shingle roof hips if not properly supported, causing roof leaks. Inevitably some plumbing will rest on the roof. The key is to reduce the potential for abrasion at key points and to secure plumbing properly. We are the ONLY local dealer in Southwest Florida that takes precautions by using specially designed plumbing spacers to reduce the potential for abrasion. There are some other things we do along the same lines that are important. By virtue of using a header clamp along the top header, the panel couplings are naturally suspended above the roof, cradled above the roof surface and allowed to expand and contract as needed. We install aluminum flashings at the lower header junctions to eliminate the risk of long-term abrasion from hose couplings. We also use ultra-premium roof-compatible sealants liberally. These are just a couple of the added steps we take to protect your roof. Why doesn’t everyone do it? Money — that’s the only reason we can think of. There is no magic here. We charge a little more for our installations, but we feel that it’s worth every penny, and you can’t put a price on protecting your roof. After all, you will have your solar panels for well over a decade, and doing it right is the only way we will do it. This was so informative. That would certainly be my biggest worry because the money you save on having solar panels for heating a pool could easily go out the window if you find yourself with a serious leaking problem. You make some great points and I think you’re right that although you pay a little more for quality service, it is so worth it. As with anything with money, you pay more for the quality and in a situation like this, that’s completely worth it! Paying more equals better quality! 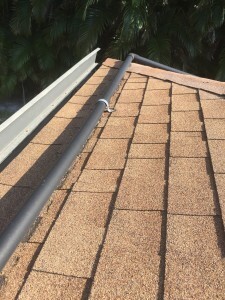 I have seen a lot of videos and pictures online and most of the roofing is in contact with the shingles directly somewhere and I always thought this shouldn’t be that way. How do you guys go about making sure the shingles will not get damaged long term? Britanica — the key is keeping wear points away from the roof. Roofs tend to wear at panel junctions and fitting in plumbing lines. Plumbing at hips, valleys, and ridges is especially problematic if not done correctly. Sometimes elevating plumbing is the best solution where providing aluminum roof protection sheets stops abrasion at others. 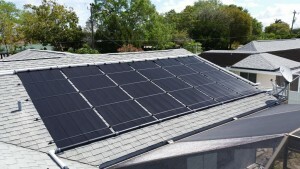 This information really helped me decide whether to go with a solar panel system. You make some great points here. The risk and reward is completely worth it. You guys seem to really have your stuff together. You’ve obviously been doing this for some time. I appreciate your thorough explanations that help me understand how it all works and am glad you offer assurances against this type of thing happening! You really do get what you pay for, so if you go with a cheaper place you will get a cheap installation that doesn’t work right. It’s best to spend a little more for the quality. Very helpful post! This is a very good article and might be something that people are not thinking about before they decide to go this route with solar pool heaters. Ugh… we just ran into another system installed by a competitor where the plumbing has worn away shingles due to poorly installed plumbing. That is sad to hear. It looks like you are well north of our service area, so I won’t be able to give you an opinion in person, but it sounds a lot like what we see frequently. The roof protection aspect of our product is what makes me most proud of our installations. After seeing hundreds of roofs with worn shingles, I knew there had to be a better way, so we sought it out and we are now the exclusive dealer in our area implementing these improvements. It’s not rocket science, but it does require time, attention to detail, and extra cost. Despite that, we will not compromise and do it the old way. There are too many people in your situation. As for the constant leaks and manufacturing defect, that sounds like a rare issue, but I can probably guess what brand it is. The thing about lifetime warranties is that they are pretty restrictive, bordering on useless. You still have to contribute to the replacement cost, and it does not cover labor. You will end up paying a similar price to a new system after taking into account removal costs. Nobody can offer a lifetime warranty realistically on something that does not and cannot last a lifetime. It’s marketing mumbo jumbo. 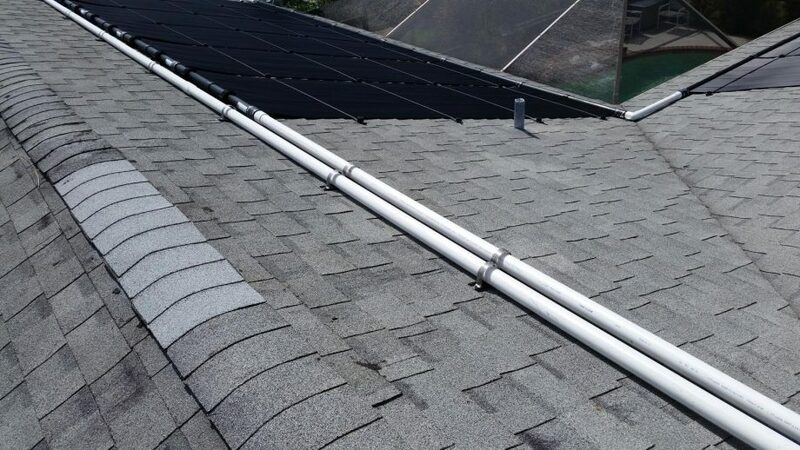 If you get your roof repaired, want a new solar pool heater, and want it done right… let me know and I’ll find someone to install it right for you, and if I can’t I will personally get it done for you. Thank you for your reply the company is *******, very poor in fact nonexistent customer back up, I told them of my problems with the system and it has been ongoing for over ten years with multiple service engineer call outs that I had to pay for, I did in the end start to maintain and repair it myself. Definitely call me. I emailed you my contact info. We are in the same situation as martin above. We have somebody from said solar company coming out to assess the situation tomorrow, but doubting they will do anything at all. We will probably need to remove the solar, fix the roof, and re-install, which can be pricey. Since we don’t want to give this company more money to remove the solar for an improper install, I’m wondering if you could provide an assessment to help repair what’s already existing up there. Absolutely, Kim. Call our office to schedule an appointment.